In recent years, newcomers have been interested in the quality of the Internet in Iraq because it affects the success of their business. The population of Iraq is more than 38.3 million people. Of these, as little as 12.8% (about 4 million) use the Internet. While cellular communication services are used by 86.16% people. Compared to other eastern countries these are quite low levels. The mobile communications market in Iraq is more developed than the Internet, so on the forums, you can often find deals on GSM termination in Iraq. This is due to the armed conflicts in the country that are taking place in the north and some central regions of the country. Therefore, unlike GSM networks, some landlines are damaged. On the other hand, the new Internet technologies and wired DIAL-Up, ADSL in the Kurdistan region are developing quite well in Iraq. According to official data, the average internet speed reaches 5 Mb/s, which is enough to install a multi-channel GoIP gateway. GoAntiFraud is designed for those who are engaged in GSM termination. You can connect your equipment to our service and increase profits of your business in the first months of work! We also offer packages for beginners NewBusiness, which include sets of GoIP, EjoinTech & ChinaSkyline equipment, necessary for a successful start. On the other hand, wire connection via Dial-Up, ADSL, DSL is suitable for termination. However, you should use VoIP gateways in more peaceful parts of the country, in the south and center, where people live and work normally. 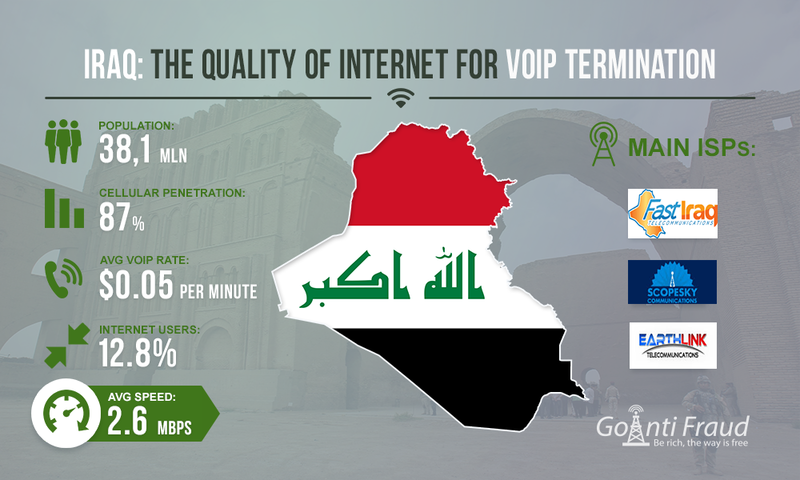 The major Internet providers in Iraq are FastIraq, Earthlink, ScopeSky Communications, Newroz Telecom, and Exabyt. Wired internet in the Kurdistan region is mainly available via Newroz Telecom. It has more than 100 thousand subscribers. The company covers the entire Kurdistan Region. It is best to use this provider packages for the traffic termination. They are Newroz Telecom X49, with a deposit of $41.29 per month. The data transfer reaches rate up to 9 MB/s, which is sufficient for the installation of multi-channel VoIP equipment. By the way, it is better off installing the devices in Dahuk and Erbil. According to user feedback, the Internet is more stable there than in other regions of Kurdistan. That means there will be less crashes and freezing, which adversely affect the ASR/ACD figures. The average cost of one VoIP minute in Iraq is $0.05. You can make about $300- $400 a month from one channel. If you install a GOIP 16 gateway, you can increase your income but you should take care of the protection of your SIM-cards against the fast lock by antifraud systems. Start a GSM termination business with GoAntiFraud! We provide a comprehensive solution that helps avoid mass blocking of SIM-cards and provide 100% efficiency of your equipment. The service is compatible with GSM gateways and SIM-banks from GoIP, EjoinTech & ChinaSkyline, and Topex.